Prime Minister Narendra Modi announced demonetization of old 500 and 1000 rupees notes on November 8th, 2016. The after effects of the announcement are quite abnormal and at the same time appreciable. One can notice the never ending queues at ATMs even now, which is after a month of demonetization. 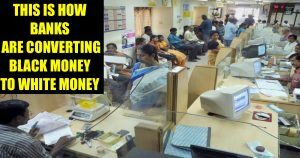 The objective behind the demonetization is to curb out the whole black money and eradicate the printing of duplicate money, despite all the possible measures, governments, unfortunately, failed to fence the illegal ways of conversion through property purchase, passage of lump sum of black currency through gray market and proper imposition of limits on Gold purchases. ‘There always opens a door when there’s will’, just like the quote the high-class businessmen are successfully playing their tactics through bank officials to convert the black money to white and at the same time, bank personnel is quite probably earning a fair amount of money by taking the advantage in the inadequate-format of deposition forms. Let us consider a small scale businessman as person A, a black money holder as B, and a bank employee as C: As mentioned before, A is a businessman who has to go on circulating money for the continuation of his business activities, as his money is considerably more, he approaches the person C and gets his money in a legal way, now, he visits that respective bank for the second time, fills the deposit form, the real issue takes place here i.e; there is no column to enter the number of 2000 rupee notes he have, so he simply submits the form and his money which is in the denominations of 2000 rupee notes. C starts affirming his wits here, he allegedly enters the deposits in the old 500 notes form in A’s deposition form. Now enters character B, who is certainly a big shot having crores of black money. B takes the 2000 rupee notes that were deposited by A, earlier, then replaces them with the 500 rupee notes he has. Here, C plays an important role as he is converting the money, so he is however well paid. The commission he earned in helping B is his earning. In this process, B smoothly converts his money and C gets fair amounts of commission. These alternative ways of conversion are quite clearly reflecting the improper execution of the demonetization. On one side, middle-class people were standing in meters long queues for their mere 2000 rupees and on another side, big shots are simply swapping their crores of money into new notes. The involvement of banks in such a blackened way is quite saddening. As many as 27 branches of various banks were already suspended in money laundering cases, many are yet not traced. Income Tax Departments’ relentless rides on banks are partly successful in grabbing a few mediators. Sources claim that major private sector bank, Axis Bank, had on Tuesday suspended its 19 officials allegedly involved in illegal activity post demonetisation. Recently, several branches of Axis Bank were raided in alleged discrepancy by some its officials. In its most recent survey, Income-Tax discovered 44 fake accounts at Delhi’s Chandni Chowk branch of Axis Bank on Friday. Central Bureau of Investigation (CBI) and Enforcement Directorate (ED) tightened the noose on bank officials since note ban to curb black money conversions into new notes, this collaboration resulted in dragging out the great amount of money. Earlier, ED had arrested two managers of Axis Bank’s Kashmiri Gate branch in New Delhi and recovered gold bars weighing more than three kg. Both were sent to ED custody till December 12.